As Friday was our last day climbing before we had to go home, we decided to try and get out a little earlier than usual to maximise the climbing. We were original considering heading to l’Éléphant as that is a favourite of quite a few of us, but changed our minds as the easier circuit is set away from the main area meaning we’d be all separated. Instead, we decided to head to Rocher Guichot which suited me fine. I’ve never been to Rocher Guichot before, and I’d done l’Éléphant many times before and I was really interested in seeing another new area. Like the other areas we’d been this week, Rocher Guichot was a very short drive and the rocks were so close you could see them from the parking which was pretty perfect. Within a few minutes we were setting up our little camp and pulling onto the first problem. 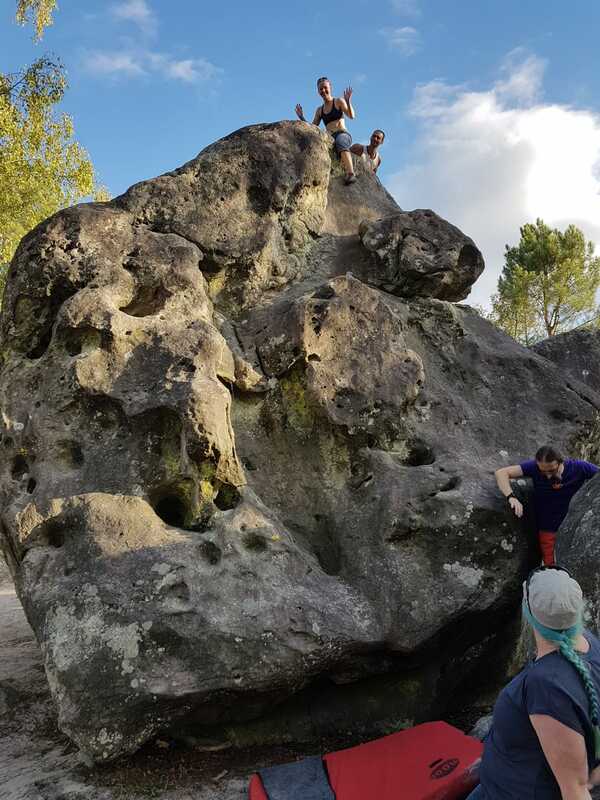 The first orange problem was a bit of a beast, a high foot, throwing the other foot on and then a groaning and grunting stand up to get the weight up and over the right foot. Once up it was simple to finish. Not sure I’d want to repeat it though! The same boulder had 3 other slabby problems on it too. The first blue (bloody impossible) an easy yellow (once you’d worked out the rather cryptic first move) and a fierce little orange slab (Orange 30 I think). This last one took a little working out, but I got there in the end. I definitely feel like my slab work needs some practice! Once done, I wondered over to the next (massive!) boulder which Andy and Martin were playing on and flashed the blue on it. Nice! Getting off was more interesting and ended up with a jump down onto a mat rather than any climbing. Just at this point, guess who turned up? Patrick! Of on one of his morning runs. He looked pretty surprised to run into us, three days in a row in different locations. 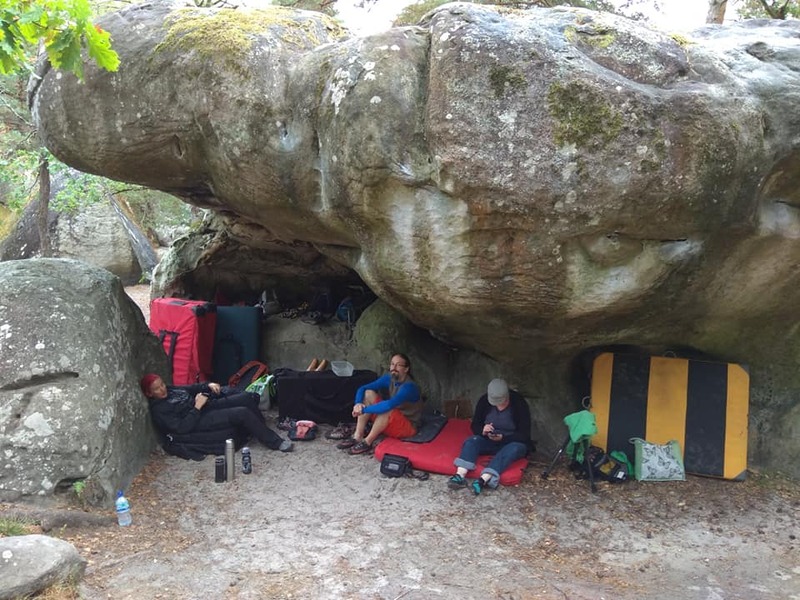 We had a good old natter where he showed us lots of photos on his phone of various places in the Trois Pignon in the winter snow and showing us a picture of the three pronged boulder that gave the area it’s name. We also had a good natter about the fires that had happened in the region over the last few years. As we were talking we started to feel a bit of moisture in the air and real rain starting to happen. We grabbed the stuff and hit them under another big prow, this time one with a cave in the back which Martin promptly climbed into and discovered more ancient marks engraved into the rock. We had a snack while under there while waiting for the rain to stop, which it did after a little bit, but then came back with a vengeance pretty much soaking the boulders. As this site was in a slow drying area, that was pretty much game over for Rocher Guichot! Eventually we succumbed to the weather and headed back to the gite, figuring we could make a start on packing to save time later and then head our somewhere quicker to dry. Once the weather had settled down again (and the sun did come out again, big style!) we headed back out to 91.1, being as it was on top of a hill and good sections of it were out of the trees. Getting to the centre of the site, I carried an extra mat strapped over the back of the one on my back. Once we’d got to our chosen kit dumping spot, everyone thought it would be a good idea to load me up with as many other matts as we could. We managed to get 5 mats + rucksack on my back before giving up. It was bloody heavy, and I managed a couple of steps before one slid off and hit me in the back of the head! The last time I climbed at 91.1 I’d spent a lot of time working on Le Flipper and I’d decided that was the plan for the last afternoon. We did a bit of warming up around the area on the oranges and some of the accessible reds. I then pulled up the red problem on the right hand side of Le Flipper (red 16). I got it second go, and it provided a useful taster for working how to get off of the top of Flipper, which is a little bit of a challenge in itself! So, then I settled down with Jim to work on Flipper. Jim was attempting Le Flipper (assis) the 7a sit start variant. Jim and I alternated our attempts but I struggled to make much progress. Looking at the videos on bleau.info, a lot of people were using their heels on both sides of the arete, which my hip flexibility just wouldn’t allow. I need to find something to practice on near Sheffield, or just get really good at fridge hugging! Everyone else barring Jim had dispersed through the forest finding fun problems to work on, but I was pretty happy chilling out on the matt and resting between attempts. 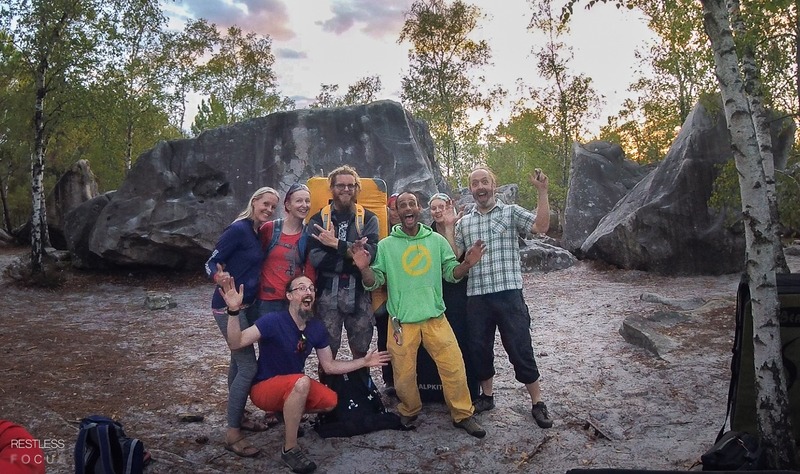 We had a couple of German guys turn up and have a few attempts in that standard bouldering camaraderie. It got pretty apparent after a while that this wasn’t going. 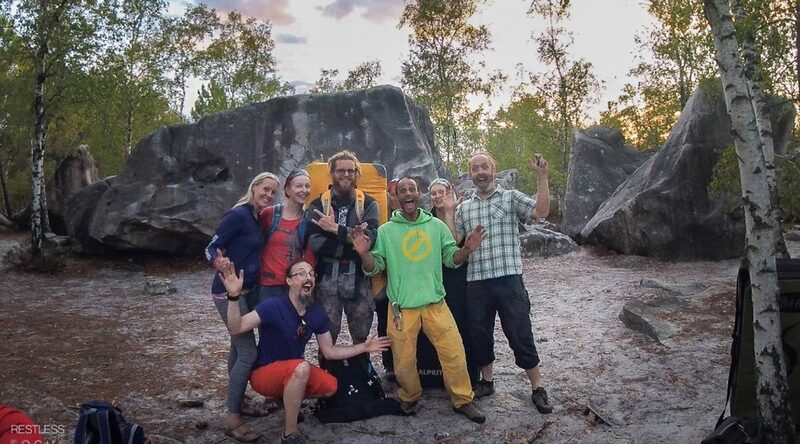 I was making some small progress in finding better hand placements, but I just really lacked the strength to start on the front of the boulder, and without the hip flexibility to clamp either side I just wasn’t strong enough. er.. how do I get down? Eventually I gave up and went to join Andy and Martin playing on other problems. Meanwhile Lolly somehow managed to convince Liz to climb a 7 meter boulder! This was WAAY outside her comfort zone, so I quickly scrambled up the decent to the top to join Jim to try and help her off. After trying to get her down the descent we abandoned that route as it needed her to turn around on a foot old which wasn’t really in view from the top and instead we scampered down the sloped top to the other edge. I sat on the edge and hung my feet over. It was still pretty high up, probably 4 metres or so, so we borrowed a couple of extra mats from the German climbers to help us jump off. I jumped off as a demo and then we coached Liz into making the jump. Oooh, scary! After a bit more playing around and feeling pretty tired, Martin reappeared saying he’d found a good problem. We all joined him on a red problem with a short traverse before climbing over the top. I arrived just after Liz had a go and jumped getting a flash. Woo! It was pretty tiring and good fun, but I was glad of some of the beta being yelled at me. I was pretty determined not to drop it near the end but it was a pretty close thing. Sheila grabbed a nice series of photos which I then animated. Then Liz got her teeth sunk in and after 2 more goes and a lot of yelling at her, she topped. What a great way to finish the climbing holiday! At that point it was the end. We got all our stuff together ready to go and grabbed a quick group shot to remember the holiday with. And that’s it for Font for 2018. We had an improv pizza night that evening to use up as much of the food we had left and got our stuff ready for heading off the next day.